This recipe was inspired by something Rachel Ray prepared on her show. Instead of spinach, she used arugula and instead of mushrooms, she used shrimp. This is a light alternative. Hope you enjoy! Place tomatoes in a roasting pan and sprinkle with a generous amount of olive oil, garlic, salt and pepper. Place into a 400 degree F oven for 15 minutes until tomatoes are wrinkled and tender. Remove from oven and mash the tomatoes. Set aside. In a pan, saute 1/2 the scallions and the mushrooms in oil on high heat. 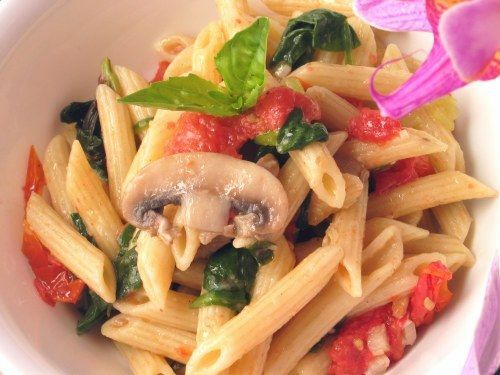 When mushrooms are tender, lower heat and add the cooked pasta. Stir in basil, spinach, remaining scallions and tomatoes. Add a bit of water. Cover pan and cook until greens are wilted. Remove pan from heat and sprinkle cheese.